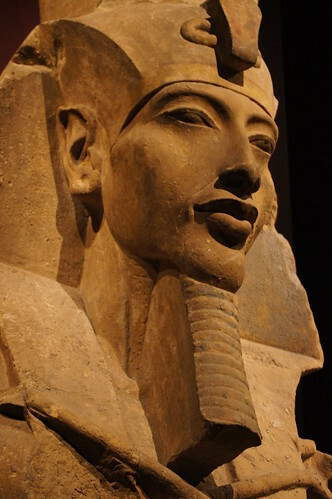 New Kingdom, 18th Dynasty, Reign of Akhenaten (1372-1355 BCE). Akhenaten's religious revolution focusing on the sun disk, Aten, had just begun, when the pharaoh had a seies of statues created for the colonnade in his Karnak temple. The different headdress on each column signified different aspects of the king. The double crown and nemes suggest that Akhenaten was the earthly representative of his new god.